English Bull Dogs - Stalwart And Loveable Companions, But Can Be Noisy Sleepers! English Bull Dogs, symbolic to Britain, are thought to be descended from mastiffs, though there were likely other breeds involved in the line. They were originally subjected to the cruel sport of bull baiting. Thankfully this barbaric form of entertainment was outlawed in 1835. Subsequently, as the breed fell into decline, a group of fanciers came to the rescue and went on to preserve and develop the breed minus its aggressive bull fighting characteristics. Like most short-muzzled dogs, they have a tendency toward breathing problems and easily overheat. Plus they have a well-earned reputation for snoring! Today's English Bull Dogs have an agreeable temperament that has earned them a following as one of the most popular companion dogs. The AKC classifies the Bulldog as part of the non-sporting dog group. There is only one way to describe this breed - he is a brick of a dog! His appearance and very large head conveys determination and power, plus the sturdiness to back it up. Nowadays, having left the bull fighting area, he is a frequent participant in the show dog arena - a much safer place to be! Coat colors include various brindles, red brindle - most desirable; solid white and pied with various brindles. Black and black with tan is undesirable. 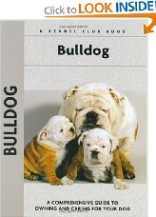 The ideal coat of English Bull Dogs is straight, short, flat, close, of fine texture, smooth and glossy. There should be no fringe, feather or curl. It is an average shedder. Maintenance includes combing and brushing plus wipe down a damp towel, especially to the wrinkled areas, and dry thoroughly. This charming and classy dog breed is very popular for his many excellent traits. First and foremost, he is a family oriented, devoted pet with a playful and very affectionate nature. Bull dogs love attention and are quite insistent about getting it - giving you a nudge here and there if you don't get the message! Relatively speaking, it has not been a very long time since breeders set about changing this dog's personality. What this means is that there can be personality differences that deviate from the ideal. For this reason, those interested in the breed should thoroughly check a breeder's credentials as well as the dog's heritage. That being said, in general, most English Bull Dogs have gentle dispositions and a high level of intelligence. They have good guarding instincts and will warn you of strangers approaching your home, but they are not a nuisance barker. Because the Bulldog is so loveable, it is easy to let him take charge of the household. If this happens, behavior problems will likely not be far behind. Some have been known to be a tad stubborn. A bulldog is far happier with strong leadership and the family that trains him with a gentle approach reap the rewards of a responsive and pleasureable companion. Most English bull dogs are not very active around the house, so they should have a daily walk. Take note of weather conditions so as not to overstress this breed in warm weather. They are also easily chilled in cold weather and could use a coat at times - just be sure it's a suitably macho one! Bull dogs are not fussy about their environment and will adapt to house or apartment. A yard or nearby open area is always recommended, but providing they get some daily exercise, it is not essential. This breed is regarded as having an affinity to bond with children. However, as with any breed, it is always the recommended policy to have an adult supervise interactions between children and pets. English Bull Dogs are people dogs and have an affectionate nature and sensitivity toward their human companions, no matter what the age. Their low exercise and grooming needs make especially ideal pets for seniors or the housebound, providing their daily walks can be arranged. Along with well over a hundred full color photographs, this book contains comprehensive background information on the bulldog including its characterics, nutritional needs, training, preventative health care, behaviors and more. Also included is some helpful advice on puppy selection and care.